FILE - Dutch soldiers are seen standing next to a Patriot missile battery at a military base in Adana, southern Turkey, Jan. 26, 2013. Turkey appealed to its NATO allies on Thursday to shore up missile defenses in the country aimed at shooting down Syrian rockets, as Germany said again that it will withdraw its Patriot batteries and the United States was set to do the same. NATO is now waiting for other nations to plug those gaps. Days after Russian jets violated Turkey's airspace near Syria, Ankara's NATO envoy urged the U.S.-led alliance to continue to deploy air defense systems, according to two people briefed on talks at a defense ministers meeting in Brussels. While NATO Secretary General Jens Stoltenberg said he was prepared to send ground forces to defend Turkey, the situation raised questions about NATO's strategy in the country, which shares a border with both Syria and Iraq. Germany's defense minister said Berlin would go ahead with plans to switch off its Patriot batteries in Turkey next week and withdraw most of the soldiers operating them before Christmas. All soldiers and material are due to be withdrawn by the end of January. "This decision (to withdraw the Patriots) is right," Ursula von der Leyen said as she arrived for Thursday's meeting. "The question is what danger can be warded off in which way," she said. The comments appeared to suggest that the Turkish air force is capable of intercepting fighter jets. Backing up that suggestion and acknowledging that there were discussions about ways to reassure Turkey and deter Russia, Stoltenberg told journalists after the morning session: "What we now see is other kinds of challenges. But again, we are discussing with different allies, with Turkey, how and in what format we can support them." As Russian and U.S. planes fly combat missions over the same country for the first time since World War II, NATO is eager to avoid any international escalation of the Syrian conflict that has unexpectedly turned the alliance's attention away from Ukraine following Russia's annexation of Crimea last year. NATO deployed its Patriot missiles in January 2013 in Turkey and Spain now has batteries in place to confront ballistic missiles launched by Syria's President Bashar al-Assad. 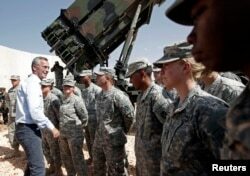 FILE - NATO Secretary General Jens Stoltenberg, second from left, of Norway meets with U.S. soldiers during his visit to view the U.S. Patriot missile system at a Turkish military base in Gaziantep, southeastern Turkey, Oct. 10, 2014. The United States will withdraw its Patriot deployment any day for modernization. France and Italy are understood to be willing to join Spain, but no decision has been taken, people familiar with the discussion say. Spain's Defense Minister Pedro Morenes said this week that although he was concerned by Russia's incursion into Turkish airspace, his nation's Patriots were deployed to defend "against attacks with missiles coming from Syria." Since 2012, NATO has detected several hundred ballistic missile launches with Syria, emphasizing what it sees as the need for an effective defense of Turkey. Officials at the U.S.-led alliance are still smarting from Russia's weekend incursions into Turkey's airspace near northern Syria. In public comments, Stoltenberg says the alliance's support of its 28 allies is unwavering. "NATO is ready and able to defend all allies, including Turkey against any threats," he said as he arrived for the meeting. "NATO has already responded by increasing our capacity, our ability, our preparedness to deploy forces including to the south, including in Turkey," he said, noting that Russia's air and cruise missile strikes were "reasons for concern". The incursions of two Russian fighters in Turkish airspace on Saturday and Sunday has brought the Syria conflict right up to NATO's borders, testing the alliance's ability to deter a newly assertive Russia without seeking direct confrontation. FILE - Russian military support crew attach a satellite guided bomb to SU-34 jet fighter at Hmeimim airbase in Syria, Oct. 3, 2015. For 40 years, NATO's central task was deterring Russia in the east during the Cold War, but now, after a decade-long involvement in Afghanistan, the alliance is facing a reality-check close to home, with multiple threats near its borders. Divisions between eastern NATO members, who want to keep the focus on the Ukraine crisis, and others who fret about Islamic State militants, risk hampering a unified response from the 28-nation North Atlantic alliance. potentially helping stabilize post-conflict governments in Libya or Syria. Others nations, including Poland and the Baltics, want a permanent NATO presence on their territory to act as a credible deterrent to any further effort by Russian President Vladimir Putin to gain influence in former Soviet states.